A classic dish wih a southern Italian accent saluting the birthplace of orecchiette, the region of Apulia (Pulia). Interesting that the heal of Italy is the birthplace of the ear (orecchiette) pasta. I guess you’ve gotta keep your ears to the ground. 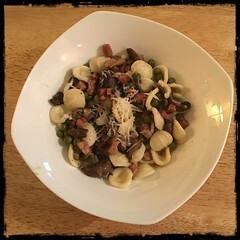 The combination of sweet peas and pancetta is a Tuscan staple but topping it off with earthy Cremini mushrooms takes it to a new level, we hope you will enjoy. 2. Add the onions, garlic, and the hot pepper flakes (optional). Cook until the onions show signs of transparency and the garlic softens. 3. Add 1 cup of white wine and 2 bay leaves let reduce. 5. Add a nice dab of butter before tossing in the Cremini mushrooms. As the mushrooms cook, you may need to add some more butter. 6. Once the mushrooms are tender add the rosemary. Let continue to cook and reduce. 7. Finally, add another dab of butter along with the peas, let cook for a few more minutes. 8. When the pasta is almost ready, take a spoonful of the pasta water and add to the sauce. This will help the sauce adhere to the pasta better. Combine the pasta with the sauce in the sauce pan. Fold in the chopped parsley, salt and pepper (to taste).